It is evident from recent events that this country will in the future have to be more self-supporting in all agricultural products than it has been in the past. While the milk industry in recent years, thanks to the application of science and a body of progressive producers, guided by the Milk Marketing Board, has been able to lift production considerably, the same cannot be said of the beef industry. The methods now employed in milk production are very different from those which existed fifty years ago, but the methods employed in beef production have shown little change during this period. 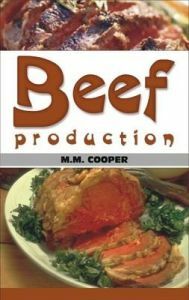 In this book author has attempt to focus attention on some of the problems of beef production which will have to be solved before it regains its position in the economy of British agriculture. All may not agree with the solutions he offers to these various problems, but the problems have been put, and if one does not agree with the solution offered then it is up to those in the industry to offer a better solution. It is evident that radical changes in methods of production will have to be made if the beef industry is to be able to stand on it sown legs. Science has shown that the young animal is a much more efficient converter of feeding stuffs into meat than is an old one, and in these days of high costs of concentrates, it might well pay the Eastern Countries farmer better to fill his yards with yearlings during their first winter rather than to fatten older bullocks. This book will be great help to farmers, industrialists, consultants, researchers, students, other concerned people and for those who wants to venture in to this field. Contents Chapter 1: Beef Production as a Component of British Farming; Chapter 2: The Development of British Beef Breeds by Robert Bakewell; Chapter 3: Breeding: Variation and its Basis; Chapter 4: Selection; Chapter 5: Methods of Breeding; Chapter 6: Adaptation of Breeding and Strains; Chapter 7: Growth, Development and Body Form in Cattle; Chapter 8: Beef Quality; Chapter 9: Nutrition Scientific Principles; Chapter 10: Nutrition Feeding Standard and their Applications; Chapter 11: Beef from the Dairy Industry; Chapter 12: Fattening of Cattle; Chapter 13: Beef Cattle on Hill and Marginal Land by A G Davis; Chapter 14: Economic Considerations.